The television commercials for "Dungeons & Dragons" tell us that it is not a game. Unfortunately, it's not much of a movie, either. Back in the '80s, some right-wing religious groups blamed Dungeons & Dragons -- the role-playing game, not the movie -- for everything from devil worship to ritual murder and suicide. That's a lot of nonsense. But watching the movie the game has spawned did fill me with violent thoughts. Profion (Jeremy Irons) prays to the Elder Gods for safe passage out of this movie. After half an hour, I was contemplating slitting my wrists. The plot -- or rather what passes for the plot -- centers on a group of misfits: two thieves (Justin Wahlin and Marlon Wayans), an apprentice mage (Zoe McLellan) and a dwarf (Lee Arenberg), who, through a series of misadventures, find themselves on a quest to obtain a magical rod capable of controlling red dragons. Also after the rod is Damodar, an ill-tempered henchman played by Bruce Payne, who was recently unfortunate enough to play a similarly ludicrous bad guy in "Highlander: Endgame." 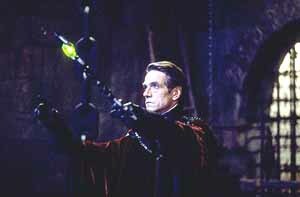 Damodar wants the rod for his master, the evil sorcerer Profion, played by Jeremy Irons. Yes, Jeremy Irons. These game-based movies, no matter how bad, always seem to attract at least one real actor, who inevitably gets to play the heavy. "Street Fighter" got Raul Julia, after all. Profion wants the rod so that he can overthrow the kingdom's young empress (Thora Birch), who, as an added complication, has a rod of her own. Except hers controls golden dragons. Oh, and the Empress has her own loyal subject, an elf (Kristen Wilson), on the control rod's trail. Basically, the plot is an even more convoluted version of the same one George Lucas has used twice ("Star Wars" and "The Phantom Menace") and that Lucas himself borrowed from Akira Kurosawa's "The Hidden Fortress." "Dungeons & Dragons" isn't merely a bad movie. It's an incompetent movie. The "camera," if you can call it that, sweeps over computer-generated castles and cities just because it can. Someone should have explained to first-time director Courtney Solomon the difference between establishing shots and theme park rides. Memo to Solomon: Just because you thought those high-speed pans through the Gotham City in "Batman and Robin" were cool doesn't mean anyone else did. And another thing: It's a bad idea to let your actors mug for the camera when their only facial expression is, "duh?" Sometimes the incompetence with which this film was put together works to the audience's benefit, like during the climactic battle scene, when bad music mercifully drowns out worse dialogue. But mostly, the movie is just plain annoying. It doesn't help that Wayans' character, Snails, is little more than a live-action Jar Jar Binks with a slightly less stupid name. The movie has two high points, which aren't so much high points as they are lulls in the storm. First, Richard O'Brien ("The Rocky Horror Picture Show") does an enjoyably nasty turn as the leader of a thieves guild. Second, Tom Baker ("Doctor Who") has a brief scene as the king of the Elves. But a warning to "Doctor Who" fans: It isn't worth sitting though "Dungeons & Dragons" just to get a brief glimpse of your favorite Time Lord. Baker himself has insulted the movie using terms I can't repeat in a family publication. Take any random episode of the "Dungeons & Dragons" cartoon that aired on CBS in the '80s and compare it to this hack job, and I guarantee the cartoon, even if you picked a bad episode, will be better. It won't even be close. And the cartoon's dragons look more realistic, too. I'm still trying to figure out why this movie was even made. The D&D game is well beyond passe. And why would anyone cast a bunch of "Dawson's Creek" rejects for a movie with a core audience (former D&D players) that's pushing 30? So, if you were hoping for a nice fantasy movie to help you endure the wait until the first installment of the "Lord of the Rings" trilogy hits theaters in December 2001, my advice is to forget "Dungeons & Dragons." Go to the video store and rent 1981's "Dragonslayer" instead.